Therapeutic Response of Repository Corticotropin Injection in Treatment of Proteinuria Due to Anca Negative Pauci-immune Crescentic Glomerulonephritis. Citation: Swan AM, Kyaw HH, Aye ZN. Therapeutic response of repository corticotropin injection in treatment of proteinuria due to anca negative pauciimmune crescentic glomerulonephritis. Arch Gen Intern Med. 2018;2(1):37-40. Corticosteroid and immunosuppressive therapies are considered as first-line therapy for patients with idiopathic Focal Segmental Glomerular Sclerosis (FSGS) associated with clinical features of the nephrotic syndrome. Choosing medications vary individually with underlying causes, renal function and response to the drugs. Here, we report a case of nephrotic syndrome with nephritic component due to pauci-immune crescentic glomerulonephritis treated with the natural Highly Purified Repository Corticotropin Injection (H.P. RCI) as Acthar Gel. A 60-year-old white Hispanic gentleman was diagnosed with biopsy-proved Rapidly Progressive Glomerular Nephritis (RPGN) with serum creatinine 3.6 mg/dl, proteinuria (5800 mg/24 hr), and GFR 18.6 ml/min/1.73 m2 and overweight (BMI>29) with underlying diabetes (HbA1C 10.6 %), hypertension (180/90 mmHg) and atrial fibrillation which made him concern to use corticosteroids such as prednisolone and his reduced GFR (<18 ml/min/1.73 m2) favor to avoid calcineurin inhibitors (cyclosporine or tacrolimus) as primary treatment. Therefore, he was given adrenocorticotropin (highly purified ACTH gel 80 U/ml once weekly) injection as a preferred alternative for one and a half year. His proteinuria decreased to 1500 mg/24 hr, and protein/ creatinine ratio decreased from 4795 mg/g to 337 mg/g. Serum creatinine reduced back to 1.9 mg/ dl and GFR 38.6 ml/min/1.73 m2. He achieved partial remission which is >50% of the previous baseline with concurrent use of mycophenolate and angiotensin-converting enzyme inhibitors or angiotensin receptor blockers. He has been tolerating well with medications without signs and symptoms of steroid-induced adverse events throughout the treatment with stable proteinuria. These results revealed that the long-term use of repository corticotropin injection gel 80 U/ml once weekly was an effective and safe therapy for patients with idiopathic FSGS and RPGN complicated with diabetic nephropathy. Repository corticotropin injection, Proteinuria, Nephrotic syndrome, Crescentic glomerulonephritis. Many treatment options have been tried to cure the patients with chronic renal insufficiency of various type as idiopathic Focal Segmental Glomerular Sclerosis (FSGS) and Rapidly Progressive Glomerular Nephritis (RPGN) associated with clinical features of the nephrotic syndrome. An extensive crescent formation of glomeruli is the characteristic feature of RPGN which usually lead to end-stage renal disease showing the signs of hematuria, decreased urine output, hypertension, fatigue, and edema . Laboratory diagnosis in these patients may have high plasma creatinine, markedly reduced glomerular filtration, and proteinuria. Some patients may not have hematuria the reason of which is not known. The disease may follow a protracted course and the treatment usually requires long-term attendance and repeated immunosuppression [2-4]. Choosing medications for renal insufficiency patients vary individually with underlying causes, renal function and response to the drugs and the results were inconsistent. Most of the first-line therapy used anti-proteinuric medications, such as corticosteroid and immunosuppressive drugs failed to get a favorable response, mostly due to drug intolerance and adverse events . Currently, usage of corticotropin (ACTH) injection has re-emerged and is the most promising treatment option for proteinuria in patients with nephrotic syndrome, patients for treatment-resistant to first-line therapies, patients unable to tolerate first-line therapies and patients with advanced disease [6-8]. The corticotropin binds to the Melanocortin 1 receptors (MC1Rs) and potentially providing a different way to impact various cells including podocytes, thus help regulate protein filtration by reducing podocyte foot process effacement and podocyte loss [9,10]. The patients treated with Repository Corticotropin Injection got full or partial remission for long-term effect. Here, we report the case of a patient suffering from proteinuria due to a mixed nephritic-nephrotic syndrome treated with highly purified repository corticotropin injection gel. A 60-year-old white Hispanic gentleman who had previously chronic kidney disease in 2015 with a serum creatinine of 1.35 mg/dl with underlying diabetes (+1 y), hypertension (+2 y), atrial fibrillation (by Holter monitor) and hyperlipidemia (+2 y). He had transurethral resection of the prostate due to Benign prostatic hyperplasia in 2011 and nephrolithiasis (2015). He presented to our nephrology clinic with frothy blood-stained urine, weight gain (10 lbs over past six months), fatigue, anorexia and weakness in February 2016. He denied any respiratory symptoms such as hemoptysis. He was a non-smoker and occasional social drinker, but he stopped drinking since the onset of sickness in 2015. He works as a machine operator in a warehouse and denies exposure to radiation and toxins. There is no history of renal stone, cancer or autoimmune disease in his family. On physical examination, he was found to have pitting edema, puffy face, body mass index 29.5, blood pressure 180/90 mmHg. Review of other systems were unremarkable. He has been on Benicar–HCT (Olmesartan-hydrochlorothiazide), carvedilol, Crestor (rosuvastatin). We controlled hyperglycemia with Tanzeum (Albiglutide), which was later switched to Trulicity (Dulaglutide) weekly injection. Urinalysis was dipstick positive for 2+ blood, 3+protein, and no leukocyte esterase or nitrites. On microscopic examination, there were a few epithelial cells and hyaline casts, and occasional amorphous crystals. Serum sodium, potassium, calcium, phosphorous, and parathyroid hormone level were unremarkable except low vitamin D (20.5 ng/ml). Thyroid function test, liver enzymes, coagulation profile and complement profile, were all within normal limits. He was negative for cancer screening, hepatitis B and C, HIV, Rapid Plasma Reagin (RPR), antinuclear antibodies, rheumatoid factor, anti-neutrophil cytoplasmic antibodies (ANCAs), cardiolipin antibodies, lupus panel, glomerular basement membrane antibodies, and cryoglobulin. Complement C3, C4 levels were normal. Serum and urine protein electrophoresis shows no paraprotein. SuPAR (soluble urokinase-type plasminogen activator receptor), CLCF1 (cardiotrophin-like cytokine factor 1), MicroRNA testings were not done. The renal biopsy revealed subacute and chronic crescentic glomerulonephritis of pauci-immune type. The detailed pathology findings included two cellular crescents, seven fibrocellular crescents and four fibrous crescents and no active necrosis. There was segmental and global glomerulosclerosis (2/38, 6/38), a moderate degree of diffuse acute tubular injury, interstitial fibrosis, tubular atrophy, and arteriolosclerosis. The moderate glomerular basement membrane thickening by electron-micrography may indicate an early, class 1, diabetic glomerulosclerosis (Figure 1A and 1B). Figure 1. (A) Crescentic glomerulus showing disappearance of normal renal texture (white arrow). (B) Electron-microscopy shows focal segmental glomerulosclerosis showing podocyte foot process effacement (white arrow). The laboratory test results of the patient done throughout the treatment period were shown in Table 1. From March 2015 to February 2016 the patient’s random urinary protein and serum creatinine increased from 38 to 365.4 (about ten times) and 1.35 to 3.6 mg/dl, respectively. The glomerular filtration rate reduced from 58 to 18.6 ml/min/1.73 m2. Loss of 24-hour total urinary protein spiked to 5800 mg/24 h (Table 1 and Figures 2, 3). These facts indicated that the kidneys were turning into severe insufficiency. As the patient’s GFR was <30 mL/min/1.73 m2, the use of calcineurin inhibitors (tacrolimus or cyclosporine) were avoided for the potential of developing nephrotoxicity of these drugs [11,12]. Also, steroids were not suitable to prescribe due to the patient’s overweight and underlying diabetes with high HbA1C level (10.6%). Therefore, it was decided to give the patient a weekly natural ACTH gel (80 U/ml) immediately after the result along with mycophenolate 500 mg 3 times daily. It was to control proteinuria and to slow disease progression combined with angiotensin receptor blocker (valsartan 160 mg twice a day). Mycophenolate level and 24-hour proteinuria were followed. Table 1. Laboratory test results of the patient from March 2015 to August 2017. Figure 2. An abrupt increase in random urinary protein in February 2016. After repository corticotropin injection treatment, proteinuria fell within 2 months. Figure 3. The spike of total urinary protein excreted in 24 hour in February 2016. The total proteins for previous months were not measured but the abrupt high excretion was evident by Figure 2. 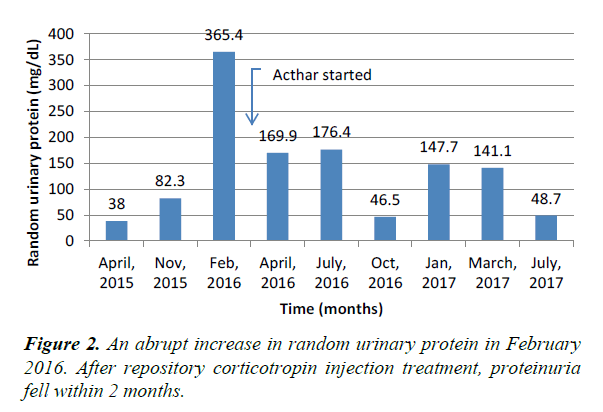 After five months of repository corticotropin injection, the 24- hour proteinuria (July 2016), declined significantly from 5800 to 2120 mg/24 h which is >50% of the previous baseline. Also, the protein/creatinine ratio dropped from 4795 to 1506 mg/g and serum creatinine from 3.6 to 2.19 mg/dl. His body weight reduced from 194 to 181 lbs within five months. Blood pressure returned around 130/90 mmHg. Hemoglobin A1C (HbA1C) decreased to 5.7%. We continued the weekly injection of ACTH gel (Acthar) injection for 1.5 year and also monitored and controlled his comorbid conditions including hyperglycemia, hypertension and mixed hyperlipidemia accordingly. We managed high blood pressure with hydralazine 10 mg oral twice daily which was increased up to 100 mg at bedtime later. The other medications include Coreg (Carvedilol) 25 MG Oral daily, Pantoprazole Sodium 40 mg for stomach discomfort, Crestor (Atorvastatin) 40 MG for dyslipidemia and Tanzeum (Albiglutide) 50 MG subcutaneous injection weekly for glycemic control which was later changed to Trulicity (Dulaglutide) 1.5 mg subcutaneously weekly. Until writing this report, the patient has been receiving a weekly H.P RCI injection. It seemed that the continuous administration of H.P RCI was necessary for maintaining the stable condition of the patient. Regarding other laboratory test criteria, coagulation profile, phosphorus, calcium, parathyroid hormone, sodium, potassium were within normal limit throughout the treatment. Anemia was improved without the need for erythropoietin injection (Hb level increased from 10.8 to 13 gm/dl). Serum albumin was more or less stable maintained around 4 mg/dl. Blood pressure was maintained around 130/80 mmHg and body weight around 180 lbs. The usual dose of Repository Corticotropin Injection is 40 to 80 units given intramuscularly or subcutaneously every 24 to 72 hours. Dosage and frequency of Repository Corticotropin Injection should be individualized according to the medical condition, the severity of the disease, and initial response of the patient. In this patient, we tailored into 80 units subcutaneously once weekly regimen. During the follow-up over 1.5 years, we observed a significant improvement in symptoms and achieved a partial remission of proteinuria with 1300-2000 mg protein per 24 hours. He was well tolerated to the treatment without showing any steroidogenic side effects. The advantage of H.P RCI (natural ACTH gel) over oral glucocorticoids might be due to their steroid-independent properties through melanocortin in addition to well-known steroid-dependent actions. ACTH acts on different types of Melanocortin receptors. Melanocortin 1 receptor (MC1R) is the major intrarenal MCR that is predominantly expressed on renal tubular cells and colocalizes with Synaptopodin in Podocytes. ACTH has additive renoprotective actions achieved by both steroid-dependent mechanisms and MC1R-directed anti-apoptosis [13-17]. There is a possible link between a reduction in proteinuria and rising levels of urinary vascular endothelial growth factor (VEGF) and monocyte chemoattractant peptide-1 (MCP-1) which reflects renal cell survival . Our findings prove that the continuous use of Highly Purified Repository Corticotropin Injection gel 80 Units once weekly for more than a year could induce partial remission of proteinuria and maintain the clinical condition without any serious adverse events for patients with idiopathic FSGS and RPGN complicated with diabetic nephropathy. ACTH injection may be superior to the standard treatment with glucocorticoids in some cases due to their unique non-steroidogenic effect on kidneys. Further research and extensive case studies for the role of Cosyntropin (natural ACTH) injections in adults with nephrotic syndrome are recommended. Couser, William G. "Rapidly progressive glomerulonephritis: classification, pathogenetic mechanisms, and therapy." Am J Kidney Diseases. 1988;11(6):449-64. Baldwin, David S. "The existence of a protracted course in crescentic glomerulonephritis." Kidney International. 1987;31(3):790-4. Keller F. "Long-term treatment and prognosis of rapidly progressive glomerulonephritis." Clinical nephrology. 1989;31(4):190-7. Ponticelli, Claudio. "Can prolonged treatment improve the prognosis in adults with focal segmental glomerulosclerosis?." Am J Kidney Diseases. 1999;34(4):618-25. Perna, Annalisa. "Immunosuppressive treatment for idiopathic membranous nephropathy: a systematic review." American journal of kidney diseases. 2004;44(3): 385-401. Bomback, Andrew S. "Treatment of nephrotic syndrome with adrenocorticotropic hormone (ACTH) gel." Drug design, development and therapy. 2011;5:147. Madan, Arvind. "Acthar gel in the treatment of nephrotic syndrome: a multicenter retrospective case series." BMC nephrology. 2016;17(1):37. Goldsmith, Christopher J, Salim Hammad. "A review of the re-emergence of adrenocorticotrophic hormone therapy in glomerular disease, more than a drug of last resort?." Clinical kidney J. 2015;8(4):430-2. Gong, Rujun. "The renaissance of corticotropin therapy in proteinuric nephropathies." Nature Reviews Nephrology. 2012;8(2): 122-8. Lindskog, Annika. "Melanocortin 1 receptor agonists reduce proteinuria." J the Am Society of Nephrology. 2010;21(8): 1290-8. Burdmann, Emmanuel A. "Cyclosporine nephrotoxicity." Seminars in nephrology. Vol. 23. No. 5. WB Saunders, 2003. Naesens, Maarten, Dirk RJ Kuypers, et al. "Calcineurin inhibitor nephrotoxicity." Clinical Journal of the American Society of Nephrology. 2009;4(2):481-508. Lauson, Henry D. "The effect of corticotropin (ACTH) on glomerular permeability to albumin in children with the nephrotic syndrome." J Clinical Invest. 1954;33(4):657. Si Jin. "Adrenocorticotropic hormone ameliorates acute kidney injury by steroidogenic-dependent and-independent mechanisms." Kidney Intern. 2013;83(4): 635-46. Lindskog, Annika. "Melanocortin 1 receptor agonists reduce proteinuria." Journal of the American Society of Nephrology. 2010;21(8):1290-8. Chiao Hsi. "Alpha-melanocyte-stimulating hormone protects against renal injury after ischemia in mice and rats." J Clinical Invest. 1997;99(6): 1165. Gong, Rujun. "Leveraging melanocortin pathways to treat glomerular diseases." Advances in chronic kidney disease. 2014;21(2):134-51. Tumlin JA, Galphin CM, Rovin BH. "Advanced diabetic nephropathy with nephrotic range proteinuria: a pilot study of the long-term efficacy of subcutaneous ACTH gel on proteinuria, progression of CKD, and urinary levels of VEGF and MCP-1." J Diabetes Res. 2013.